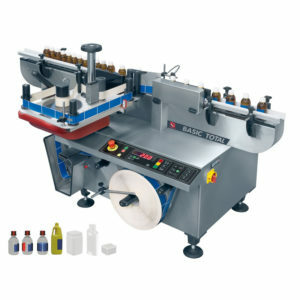 Labelling System, the Basic 300 is an easy to operate labelling machine with label counter. With pre-set batch control, keyboard and digital display suitable for a wide range of cylindrical labelling applications. It has a stepper motor for fast and accurate labelling. A motorised bulk label spool with automatic tension control and end of reel sensor with opaque label detection as standard. Pneumatically operated three roller label applicator for optimum label placement. Easily adjustable pre-dispensing and label positioning with graduated scale. Easy to operate integrated controlled system with label counter and pre-set batch controls, keyboard and digital display. Suitable for a wide range of cylindrical labelling applications for vials and ampoules. Stepper motor: Fast and accurate labelling. Motorized bulk label spool with tension control and end of reel detection. Easily adjustable pre-dispensing and label positioning with graduated scale. Optional IQ/OQ support package available. Hygienic design using FDA approved materials. Firstly output speeds for labelling machines depends on the shape and material of the label. Secondly are you looking to do wrap round labelling / front labelling / front and back labelling, Consequently perhaps you require a mixture of all three? In some cases top or bottom labelling may be required along with coding of some description. Therefore in conclusion if you are unsure of the labeller required this chart gives an illustration of various labelling machines and their applications. Please contact a member of our KBW team for project specific advice on the best labelling machinery for you. Consequently we will advise the output that can be achieved.